This weeks design came from two necessities. One was that my nails are still very short. However there was a more serious factor I needed to consider. I bought two new nail polishes and I couldn't decide which one I wanted to use so I used both. However they aren't colours I would usually put together so I though a bordered nail design could work. After base coat, paint the entire nail your border colour. It will look best if this is a darker colour. With your second colour, carefully paint over the base colour making sure to leave a border visible on the sides and the base of the nail. You don't have to bother yet with leaving a border at the tip of the nail. Add another coat or two so that the base colour is no longer visible. 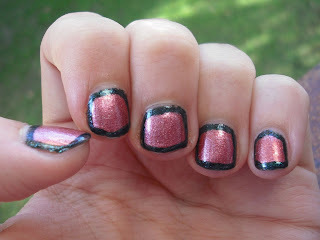 Take a striper brush and using your original base colour, create a border along the tip of the nail to finish the look. If you made any mistakes with your second colour you can also fix them up with the striper brush. A little quiestion, What nail trends are you loving at the moment? Haha, yep, thats basically what happened to me. Nails were starting to get a bit of length again and then I went and broke two so all the rest had to become short again. How cute! I love this border effect, saw it done recently but totally forgot about it! thank you for the reminder, must give it a go! Its actually a lot easier than I though it would be. I though I wouldn't be able to get everything looking even and straight but it isn;t too much harder than just painting your nails normally. Great post! Im sick of my long nails and am ready to cut them off!! Love the boarder effect, Ill def give it a go!